Wadda Gurdwara Ipoh calls in police before AGM today. Some members unhappy on being struck off the membership list. ASIA SAMACHAR speaks to parties involved. Police presence at Wadda Gurdwara Sahib Ipoh (WGSI) during its AGM on 28 Feb 2016. Photos from one Sikh-based social media chat group. Police turned up at an Ipoh gurdwara, probably the first such incident in recent decades, during an annual general meeting (AGM) today that saw dozens of members turned away due to lapsed membership. “We had called the police to ensure safety of the Sanggat. Some members had become physical, some were rowdy before the AGM began,” Wadda Gurdwara Sahib Ipoh (WGSI) committee president Amarjit Singh Gill told Asia Samachar. It is understood some members had become upset by what was deemed as an arbitrary ruling by the committee on their membership status. “Some members may have felt this was not a fair deal. Their membership had been struck off without any proper and prior advisory,” one member who attended the meeting told Asia Samachar. This year is a non-election year at WGSI. Amarjit had won the president post unopposed at last year’s AGM. The position would be up for grabs at the AGM 2017. WGSI constitution allows a president to serve two consecutive temrs of two-years each. Prior to him, Bhajan Singh had served as WGSI committee president for four years. 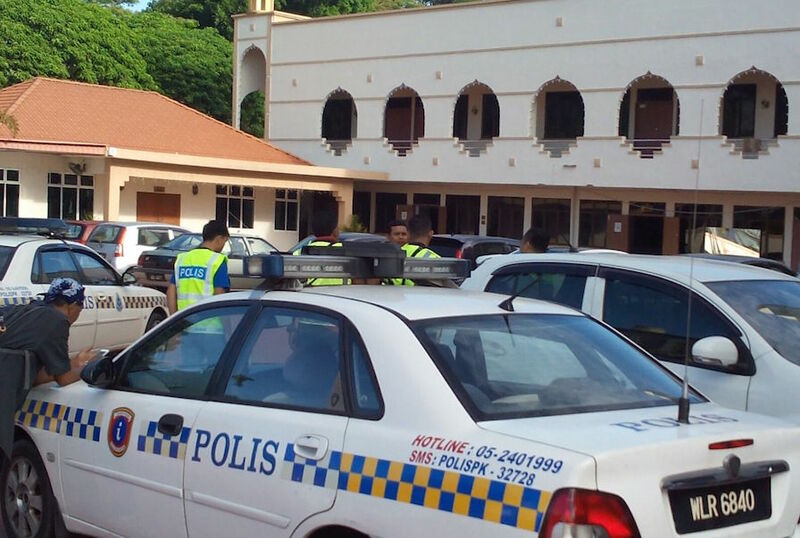 Policemen were seen at the compound of the WGSI, one of the bigger gurdwaras in the state capital of Perak, this morning (28 Feb 2016), prompting messages on the local social media circuit. “Calling police to the gurdwara, shame on you,” read one comment in a Sikh chat group. It is understood that the WGSI committee had decided that members who had failed to update their chandaa, or membership fees, would not be allowed to take part in the meeting. Members present at the AGM were told that the committee was merely adhering to the gurdwara’s constitution, which states a membership will lapse if fees were not paid for two consecutive years. It is understood that some 80 members were struck off due to non-payment of membership fees. One of the members not allowed to join the AGM was Dr Ranjoth Singh, an Ipoh-based obstetricians and gynaecologists, who had served in senior positions in the gurdwara commitee for more than two decades, including as the deputy president during Bhajan’s presidency. “I was not allowed to speak,” he told Asia Samachar, but declined to comment further. It is understood that his membership was paid-up till 2014. Another WGSI member, who was also not allowed to join the AGM, felt that ‘justice was not done’, especially those who had served the gurdwara for many years. “We did not receive any notice that our membership would be struck off for non-payment. I didn’t even receive any notice on the AGM, I heard about it from friends,” he said. Some members have voiced their unhappiness with certain decisions of the present committee, including the handling of the recent year-end kirtan programme which saw the Sikh Naujawan Sabha Malaysia (SNSM) Perak taking it the annual programme called Nava Saal Guru De Naal to Gurdwara Sahib Railway Road instead. However, in the short span of his presidency, Amarjit has managed to secure government funding totalling RM400,000 for the gurdwara. The first grant of RM200,000 was received from the Federal Government in June 2015. It was meant to undertake much needed renovation, especially for the darbar sahib (main prayer hall), which was estimated to cost RM400,000. Sikh graduara election s are not political elections These are supposed to be held in open sangat, not in secret.Thus any Sikh should be able to be present …fully paid chanda or not is no criteria to ban anyone in the sangat. Chanda is not part of Sikh maryada.Daswandh is a Sikh protocol.Chanda is a recent invention to help maintenance of Gurduara..not a criteria for Sikh selection of Gurduara parbandhaks.The yardstick…is the dsgmc and sgpc.All Sikhs can be registered voters ..but not all are paying members .Registration for the dsgmc or sgpc are necessary,just because voters amount into millions. We are small community,any intelligent leader or commitee will seek to unite the community through communication clarity,not through threats to terminate people’s ties or membetship through such short sighted technical excuses. YES,it may be not economical to send out reminders:but what stopped such announcements being made weeks before ..or holding two hours sessions every week prior and bring up to date the memberships. But as said Sikh Gurduaras should be held in open sangat -transparency is a fundemental requirement of Sikh ethos historically and factually and according to maryada . Why was the police necessary to b present within Gurduara grounds?Was there really a threat from sangat?Which sangat was to be protected? This calling of Police is an insult to the Guru and the premises where…no tobacco or ciggerettes should be allowed …how do the parbandhaks assure the sangat that none of these none Sikh cops were not carrying such products on their body in the premises?Were those who called the police prepared for the police to enter the darbar sahib with shoes on. ..against the “lapsed” members of chanda? Most Malaysian police are often seen openly inhaling tobacco,even when on duty in public. The whole issue stinks far more deeply than it shows, from the many number of accusations made, looking at the comments. I think it is the duty of any earnest president to explain the actions that cause such unecessary division ,split and police to be called, esspecially when NOT one from the alleged “trouble makers”was spoken to by police,let alone arrested. It appears the sangat has lost confidence in the current. comittee.In such circumstances,there is only one way OUT to resolve the issue. HONESTY..AND OWNERSHIP OF RESPONSIBILITY -APOLOGY IN SANGAT OR EXIT. THE Sikh maryada shows that Panj piare have a role to play here; to ensure transparency and bring the sangat back together in UNITY . GURU SUMMAT BAKSHE SABH NU .GURU RAKHA. Why were they afraid of the 80 members and why the police? matter of courtesy should apply in this case. prior weekly announcements could have been made or notices puts up by gurdwara committee that non clearance of yearly dues will means denial of entry to AGM and rights to vote forfeited. being gentlemen in the name of brotherhood is one thing and being particular with technicalities of constitution is another matter more so when it is followed by ulterior intents. If the practice of accepting arrears was done in the past and then all who settled their arrears became eligible voters then why in this year the committee decided to enforce the rule which may give the impression that there might have been an ulterior motive of the current committee members. There are many cases where arrears have been paid on the day of the AGM/EGM as it is not a normal practice of removing any member of the Sanggat. The Committee in this case may have forgotten that the it is the Sanggat who provides the funds for the operations and development of the Gurdwaras and not just those members in benefit or those who sit on Committee. I also agree that it is not administratively cost efficient to send reminders as the annual membership subscription may be only a few ringgit and most are just too pre-occupied to issue a cheque and thus have been paying lump sums prior to AGM/EGM as it is more practical. In order to avoid this problem several Gurdwaras and NGOs have life memberships and many do this as the one time payment subscription amount is just a few hundred ringgit [between RM201-RM501] whereas the monthly subscription may be between RM1-RM5 or RM10-RM50 per year. Can this and other Gurdwaras be transparent and publish their accounts for all the Sanggat to see and not just the few members who pay a few ringgit annually as membership fees? It must be remembered that lack of transparency gives rise to suspicion that not all is right with the Gurdwara Funds and an article on this was written on request and made available for all to see on ASIASAMACHAR blog. A non.payment of chanda is not an excuse to terminate a Sikhs membership of Gurduara. CHANDA is not required according to the Sikh operational policy. A Sikh is volunteerily expected to offer daswandh. ..one tenth of earnings . Chanda is only a current invention to help maintain the gurduara bills. So this is the lamest excuses given by the president. A Sikh Gurduara election is not held as party politics within closed doors. Whether one has paid a chanda of not,the election is supposedly to be held in open of sangats presense .Even if visiting Sikh is present in sangat. Or non Sikhs are present . To intimidate the sangat. IF he was intimidating the sangat ,then wich sangat was he protecting as he claims . Like one Sr Gurcharan Singh said, given the small Sikh population,the chanda should not be used as a political weapon to get rid of people he knew will not support . THE sangat SHOUlD BE AWARE.,IF THERE ARE FOREIGNERS MADE MEMBERS OF A MALAYSIAN ORGANISATION,then this is wrong and should be reported to the registrar of societies as if illegal to have foreigners as member with special permission if I m not wrong. IF this Amarjit has any iota of integrity left ,hs shoukd resign st once and hand over the management to panj piare Who should then do a transparent investigation and advise on future step. AMARJIT HAS GIVEN THE MOST LAME EXCUSE FOR INCMVITINF THE POLICE INTO THE GROUNDS OF THE GURDUARA..it is apparent there was a lot of hot emotions and heat flowing in the sangat but not one was arrested.This shows the police was not necessary but amarjit fearful of his antics over ‘ acted against the sangat. If amarjit fails to be honourable and honest he snd his family be reported to the Akal takhat and not allowed to get away. Support the railway Gurduara more . Shame such over ego’d invite police and disgrace thd community. Hardip Randhawa: Such an embarrasing and shameful event. Saw with my own eyes. Jai shin Singh: Shame on the committee! Getting political funding is great but how much have been channeled to the poor Sikh families in and around Ipoh? Leave your family politics out of the Gurdwara! This is happening all over not only in WGSI, and you wonder why young Sikhs are turning their backs from being involved in Gurdwara matters. Harpreet Sangeh: Coming from a family that has been actively serving wadda gurdwara Sahib for at least 4 generations, both maternal and paternal side, I was distraught to find out that my parents were removed from being members of gurdwara Sahib for late payment of Chanda despite always taking part in gurdwara. Although, the Chanda was late, they have supported the gurdwara in every way possible financially. Wadda gurdwara has always been a priority in our household but yet, they were not given a chance to speak at the meeting and was initially prohibited from entering the meeting venue. I know for a fact that the gurdwara is very dear to them. Our entire family practically spent most of our free time from school and classes during younger years in wadda gurdwara itself. From punjabi classes to even playing hide and seek in the gurdwara compound with our friends. It broke me apart to see what has become of the gurdwara. I was shot down everytime I wanted to raise up an issue today by saying that I’m not a member and I cannot take part in the meeting. It was literally like telling us to leave our own parents house because we forgot to pay rent. Daljit Kaur: Witnessed this today. Very very sad. Instead of bringing the Sikh community together almost 80 members r terminated due to late chenda payment. N maids from India r members! All those who r terminated r not allowed to attend meetings even as observers. No notice or reminder were receives by them not even one got the letter the committee hv sent! The postman fault!! The committee said. Later the president sister ask the sangaat if Jpj or road tax ppl got give reminders? To that they clapped! Turning the Gudwara into a place of conflicts. What a shame! Raspal Kaur: This is when the Gurdwara Council of Malaysia should step in to help d sanggat who needs them..They should not turn their backs. Jaswinder Bindey: Shame on the committee who started and sparked all the chaos where everything could have settled by polite discussion if channel in proper way. Just by not paying chanda about 80 members were expelled from the membership, question is why? Just affraid that more questions will araise during the AGM?? Cowards…. Harjit Rendawa: A Sad Day for the Ipoh Sikh Community. No resons justifiy calling in the Police into the Gurdwara Sahib permises. This is what happens when you make Gurdwara ‘s as Your Political Base and Money in the Gurdwaras account the main Motivation for many to serve in the Committee. Gone are the Days when the Main Purpose of the President and his Committee was to Serve as SEWADARS OF OUR GURUS. In my Military terminology the Situation is a S N A F U.
PhagSingh Grewal: We shouldn’t be so strict regarding membership. If one pays his dues during the AGM we should accept. It is a Temple AGM and not a political party. We should think of unity unless you are craze of power. People who crazy of power dont last long because the power lies with the sangat. It is disgraceful when police show up at the AGM. In such a case the President should step down because he has failed to carry out his responsibilities. The whole Malaysia knows of this disgraceful AGM , do you still want to remain as President ? KSharan KSharan: Embarrasing. The first thing i notice when receiving the pictures. The police in the compound without covering heads. Should stay outside the compound. Only turn up if a report is lodged. It is a total disgrace to the Sikh community. The Gurdwara does not belong to any 1 individual but to the sanggat… if at all the excuse for striking out the members name is that the member had not paid the chandaa , the question then arises was any letter/notice sent out to the member in regards to the lapsed payment ?? ?..If no, why not ?? ?.That sh be the duty of the committee. Was any of the member armed at the meeting that the police had been called in or was it just a show of power…no one sh become “big headed” and go about doing the affairs of the temple as a dictator and expect the rest of the members to be a”yes man”..this is not a political party….respect has to be earned !!!. This is a sewa…if you cannot do it with good intentions but have other ulterior motives, the president and its committee shld get reday to be booted out.!!!!! Shame to all involved.I have noticed that the committee do not inform the member that their membership has lapsed.Their duty is to inform those who might have forgotten to pay.This is a one year once affair.We are human being.We do forget that it’s time up to pay.Blame the committee.Worse,calling the police into the Gurudwara.Shame on all of you involved. The issue is chanda not paid so no entry as simple as that.. i dont follow any gurdwara political groups as i go to gurdwara to be wth god not the party.. my chanda is to gods house when i matha tekh.. nevertheless… what i read was disturbing that chanda is paid only at agm time to talk.. like buying a ticket to a movie show. Why not just pay yearly. That is what is called a membership yes? Forgive me if I said anything wrong. God is great in his house his money his chanda…. no human can do anything wthout his approval. Rab Rakha. At the gates of heaven and hell.. you stand alone to answer for your actions.. It is a disgrace but such ‘invitations’ have happened in the past in some gurdwara elections. The common denominator was substantial funds in reserves. The funds provided opportunities for fraud and corruption for personal greed. Even this problem may exists in SGGS because of hundreds of millions in annual collections and assets. This is my personal observation. Could the high funds be the cause of disputes and need for police? This is common in other religious institutions where annual collections are in hundreds of millions and assets in billions.